Refresh your jewelry collection with the spring green color of a peridot. This beautiful gemstone is bursting with bright color, and set in the art deco style band, it's a sure fashion statement. Apples of Gold brings their high quality guarantee to this piece with a 6mm round cut peridot. The gemstone is fastened with a four-prong silver setting that is accented by two swirls of silver. The band, also of silver, gives art deco design a lovely display with expertly carved details. 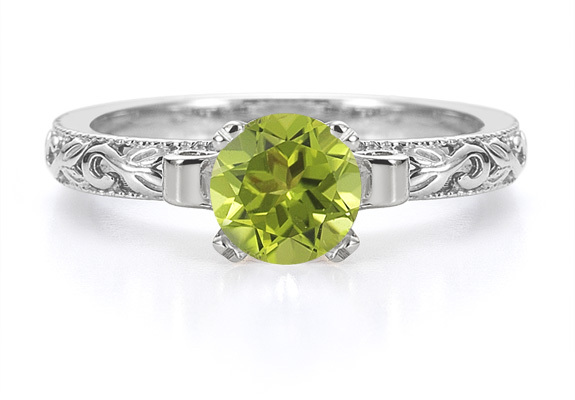 We guarantee our Peridot 1 Carat Art Deco Ring in Sterling Silver to be high quality, authentic jewelry, as described above.